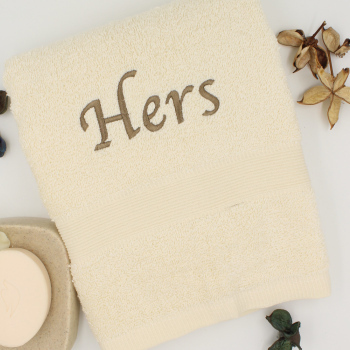 Personalised hand towel in ivory cream, a unique and useful gift for home or beauty salons, gym. Personalised hand towel in ivory cream, a unique and useful gift for home or beauty salons, gym. Popular for birthdays, wedding, anniversary gifts, or sport towel. This hand towel is soft cotton 49x90cm. Personalised with your choice of embroidered text and sewn in a embroidery thread colour and font style of your choice.